The National Socialist German Workers’ Party—better known as the Nazi Party—was founded in 1919. With the rise of the Nazis, anti-Semitic and racist ideas that had been gaining traction in Europe since the last decades of the 19th century were activated, expanded, and implemented in Germany. Nazi ideology called for the creation of systematic anti-Semitic policies, strong opposition to Communism and democracy, and a particular version of social Darwinism that called for the superior “Aryan race” to assume its rightful role of ruling the world. The popularity of Nazi Party rhetoric is often analyzed within the context of the political and social climate in Germany at the beginning of the 1930s. The economic crash rash of 1929 and the resulting economic depression crippled the country and plunged much of its population into hardship. The lasting effects of Germany’s defeat in World War I and the consequences entailed in the Treaty of Versailles also fed the popular appetite for extreme nationalism in Germany. 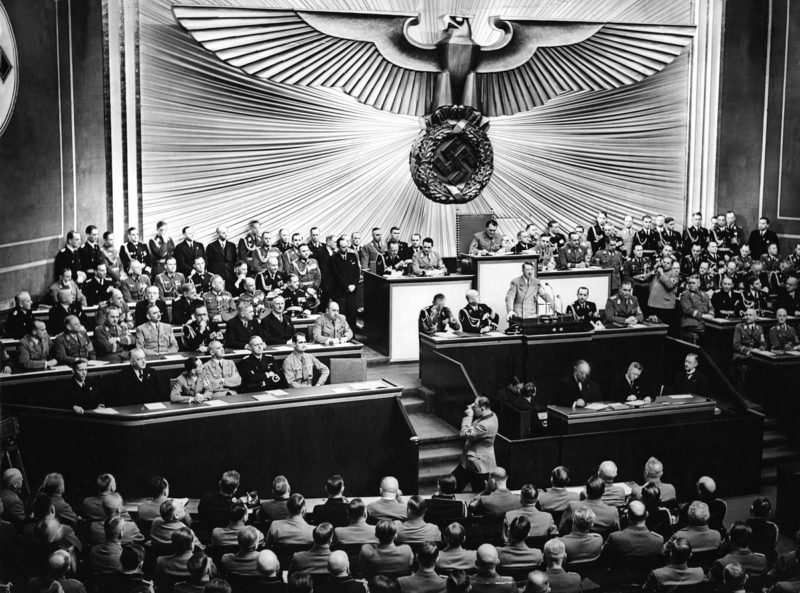 Adolf Hitler used direct, populist language and careful stagecraft to appeal to mass audiences. © German Bundesarchiv. Adolf Hitler, a prominent leader of the Nazi Party, presented himself as the savior of the German nation and national identity. He promised to not only restore former glories, but also establish the “Aryan race” as the rightful conquerors of the world. Popular support grew for Hitler’s positions and ideology—including that the Jewish people were primarily responsible for the nation’s undeserved misfortunes. The Nazis also falsely blamed members of other minority groups for contributing to the conspiracy to sabotage German purity, natural superiority, and greatness. Hitler lost the Presidential election in 1932; however, he and other Nazi candidates won 37.3% of the popular vote in July 1932. They won 33.7% of the popular vote in the November 1932 elections. The Nazi Party became the largest political party in Germany and the majority party in the Reichstag (parliament). Through a series of political maneuvers, Hitler was appointed Chancellor of Germany by President Paul von Hindenburg on January 30, 1933. He began to expand and consolidate his powers, working to “legally” transform Germany into a dictatorship. In February 1933, the Reichstag Fire Decree suspended civil rights and instituted a police state. The ruthless Nazi SS (Schutzstaffel, “protection unit”; a paramilitary organization) increasingly controlled the police. In 1934, as Nazi Party support increased within the government, military, and citizenry, Hitler declared himself the Führer of the German State. Germany’s transformation into a totalitarian police state ruled by the Nazi regime—the Third Reich—was official. It had taken less than six months. The Nazis institutionalized anti-Semitism, introducing discriminatory and increasingly oppressive laws and policies. Beginning in 1933, anti-Semitic legislation was enacted in order to segregate, isolate, and economically target Jewish people. Jews were stripped of their rights, including the right to participate in civil society, own businesses, and send their children to German schools. The Nuremberg Laws, introduced in 1935, institutionalized Nazi racial theory—prohibiting, for example, Jews from marrying people of “German or related blood.” The authorities, Nazi Party members, and civilians also organized and participated in anti-Semitic boycotts, book burnings, and other acts of abuse and terror. In occupied Poland, Jews were forced into prison-like ghettos, plagued by hunger, disease, and severe overcrowding. Savage SS death squads roamed the Polish and Soviet countryside, rounding up and shooting Jews by the tens of thousands. Dachau, the first concentration camp, was built in Germany in 1933.